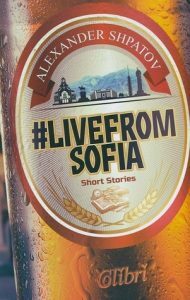 Live From Sofia is a collection of short stories exploring the unique landscape, culture and atmosphere of Bulgaria’s capital city. The stories range from amusing excerpts from a modern-day walking tour of the city, to a priest’s attempts to build a church during the Communist period. The city is the only central theme, as the stories are widely varied in narrative style, tone and topic. There is a deep sense throughout all the stories that Sofia is somehow irrelevant to the world at large but the centre of the universe for those inside its limits. It’s an intense and rather stifling feeling that is at once pride and hopelessness. Many of the stories contain elements of fantasy, hyperbole or imagination, that force readers to re-evaluate what they have read, for at the beginning everything appeared to be a true account of events. It’s up to readers to decide if any or all of the tales are true, and the author seems to delight in blending historical fact and personal anecdote with local urban legends and satire. There were two standout stories. The first was the search for a Princess, for its humour and unexpected twist, though the format as a phone call transcript was jarring at times. The second was the tale of the concrete block church in a Communist housing block named ‘Youth’ which was an interesting insight into how that period of Sofia’s history is viewed. When read as a whole Live From Sofia is lacking in the contrast of insight needed for a really compelling short story collection. Some of the tales dragged on far too long after they had made their point, in particular the long-winded public-monument-as-a-urinal joke was a rather painful read. This collection is best suited for visitors to Sofia or those living in the city. The essence of the story arc connecting the tales is the city itself, and without some sort of connection to Sofia it would be hard to understand many of the references which are not explained at all.